For years the frontier settlement of OLED-ville has been a one horse town. The futuristic TV technology has existed in LG isolation, with the Korean display giant pumping around $1.5Bn into R&D and manufacturing in order to make the glorious self-emissive OLED panel a reality. And a great job LG has done in creating some of the most beautiful TV pictures we've ever seen. But another player has just ridden into town, looking to take on LG's best OLED screens: Japanese home cinema brand Panasonic. With the release of the new Panasonic TX-65CZ952 TV there are now two key players at the top of the TV game fighting it out in the OLED corral. OLED is seen by the A/V enthusiasts as the true successor to the old plasma technology, so it makes sense for Panasonic's home cinema heritage to bring it into this advanced new market. The reason for OLED's glorious images is because of its self-emissive nature. That means each and every pixel in the panel is capable of creating its own light and that in turn means there's no need for any backlighting to shine through from the back of your TV. That has a number of effects. Primarily it means OLED panels have unrivalled levels of black reproduction, as individual pixels can effectively be turned completely off. It also makes for stunning levels of contrast as pixels sat side-by-side are unaffected by the light from the other. And great contrast can make for great colours too. It's this range, from the deepest blacks to the most vibrant colours, which makes OLED a mighty impressive base for high-dynamic range (HDR) content too. And without the need for a layer of LED backlighting behind the panel OLED TVs can be gloriously slim too. Who has the best OLED tech? First off it has to be said these televisions do not live in isolation from each other. At the heart of Panasonic's TX-65CZ952 is an LG-made OLED panel. LG has spent the money on making OLED a viable platform for premium TVs and the entry price for this OLED option has dropped dramatically in the last couple of years. We expect to see 55-inch panels coming in under £2,000 by the end of the year, which is pretty astounding progress. So it's now gotten to the stage where LG's happily licensing out its panel technology - as it has historically, being one of the biggest panel manufacturers in the world. Meanwhile Panasonic has got in there early to create its own new flagship TV. Which does go some way to explain why there is such a huge price difference between the top two OLED panels. The Panasonic TX-65CZ952 is some £7,999 while the LG 65EF950V can be found for half that price, retailing at 'just' £4,000. So, why pay more for the same panel? A panel alone does not make the TV. Sure, Panasonic has taken the basic OLED technology from LG, but there is a lot more that goes into making a quality TV with as glorious a picture as the CZ950 series. The picture processing is what adds all the contrast finesse and subtle nuances to an image and Panasonic maintains its new 4K Pro system is the proverbial 'daddy'. With the sort of lighting control tech only seen in studio mastering monitors it's the first OLED TV to pass the rigorous THX testing procedures to gain THX certification. Panasonic's TV has also introduced its Absolute Black Drive too, which puts pay to one of LG's most frustrating issues with its OLED displays. It manages to produce fine control over light levels which are just a fraction above total black, something LG has struggled with in the past. LG's webOS 2.0 is widely regarded as the best TV operating system around. Mostly because it knows its job is to service a television first and foremost, not an overgrown tablet that Android TV wants to be. The webOS interface on the LG 65EF950V is clean and never gets in the way of using the TV and has the full complement of catch-up and streaming services too. Panasonic's use of Firefox OS has stood its own smart TVs in good stead, but curiously it has eschewed that software for its OLED flagship. That means the CZ950 series has a dearth of catch-up goodness here in the UK and less in the way of smarts. Panasonic maintains this is in order to preserve as much processing power as possible for all the imaging tech. Both the LG and Panasonic screens are capable of displaying the glorious HDR future. LG's TVs are already capable of displaying the HDR 10 standard Amazon (and potentially Netflix next year) streams its existing HDR content with and is working with the BBC, helping it nail down its own Hybrid Log-Gamma standard for HDR broadcasting. 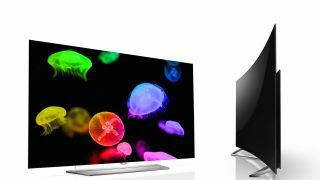 Panasonic though is still putting together an upcoming HDR firmware update to introduce the advanced picture technology to its flagship TV. But the broad range capabilities of both the OLED panels will perfectly compliment high dynamic range content when there is more of it about. When you make televisions ever slimmer, to make them light enough to stick a 65-inch screen on the wall, or just to make them more aesthetically-pleasing, then something's got to give. And that something is the sound. You can't put beefy speakers into a slimline TV chassis, but LG has worked hard - in cooperation with Harmon Kardon - to ensure the 65EF950V has pretty decent sound. Certainly much more powerful than Panasonic's relatively thin-sounding speakers. But realistically if you're dropping this much cash on a flagship TV then you're going to be spending some serious money on a separate sound system anyway. Which begs the question as to when TV manufacturers are likely to stop bothering putting speakers into their top-of-the-range models? How do these two top-end tellies compare physically then? Well, that depends on which side of the divide you stand on regarding the flat vs. curved debate. If you can't stand the curve - and to be fair most AV enthusiasts aren't so enthused about the weird geometry and odd reflections you get with a bent panel - then your only option for a flatscreen OLED display is LG's gorgeous EF950V. If anything the sheer scale of a 65-inch flat OLED is far more arresting than the curved alternative. But Panasonic's CZ950 series wears its curvy panel well, with an effective screen filter which knocks down much of the off-axis reflection distortion. Still, we'd rather have the Panasonic's glorious images on LG's flat panel any day. So, which is the best TV? If we're judging purely on picture quality then it's the incredible Panasonic TX-65CZ952; it produces simply the best images we've ever seen on a television. The TV calibration, carried out by Hollywood colourist Mike Sowa, combined with the THX certification, makes this a key moment in the history of television tech. But when LG's still jaw-droppingly good flatscreen 65EF950V is half the price, the Panasonic is tough to justify. Though in relative terms the LG OLED is the more affordable option, and is the implementation of the technology which is more likely to find its way into people's homes, the true AV enthusiast will always be dreaming of the stunning Panasonic CZ950 series. These are the best TVs around right now.